It's because of William Gilbert that electricity got its name and he produced some of the first work that explained magnetism and electricity. Pretty impressive stuff, especially when you consider that he carried out his work during Elizabethan times. 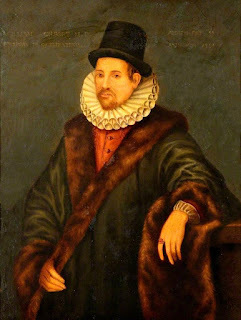 Gilbert was born on May 24th 1544 in Colchester, England. William Gilbert should be much better known than he is. His contribution was highly significant, both in his specific insights into magnetism and electricity (tech fundamentals) and in his influence on the scientific method which enabled so many other discoveries to be made. Gilbert introduced the word 'electricus' which means 'like amber' in Latin to describe the way amber attracted small items due to what we now call static electricity. The word electricity develops from 'electricus'. Gilbert wrote a book called "On the Magnet" (actually he wrote it in Latin as was usual for scientific works of the time and it was called "De Magnete".) Magnetic compasses were widely used for navigation during Gilbert's time and often called lodestones. One of Gilbert's experiments was to test the folk wisdom that a compass need is affected by garlic. That's how far along science was! "As to what some writers have related, that a load-stone will not attract iron if there be a diamond near and that onions and garlic will make it lose its vertue; these are contradicted by a thousand experiments which I have tried." Gilbert was the first to propose that the Earth's core contains iron and that that magnets point north because the Earth itself is a giant magnet. William Gilbert was a respected doctor as was personal physician to Queen Elizabeth the first at the end of her reign. Gilbert used practical experiments to test his theories. His work was a significant step towards the scientific method. Although magnetism and static electricity were know about the Ancient Greeks (around 600BC) the understanding of how they worked didn't progress much until Gilbert took on the the task over 2000 years later! Alfred Carlton Gilbert the US scientific toymaker famous for inventing the Erector (Meccano) construction toy. A.C. Gilbert created a Magnetic Fun and Facts science set for children. The National (US) High Magnetic Field Laboratory have created some excellent resources including a page on William Gilbert and a set of activities that explore magnetism and electromagnetism. The Who Was the First Scientist video covers Gilbert's contribution and the influence he had on Galileo who is much better known. Gilbert also features in this awesome Spanish language video on the history of electricity. This mini site about Gilbert by Dr Stephen Pumfrey of Lancaster University pulls together some interesting resources for those who want to find out more.